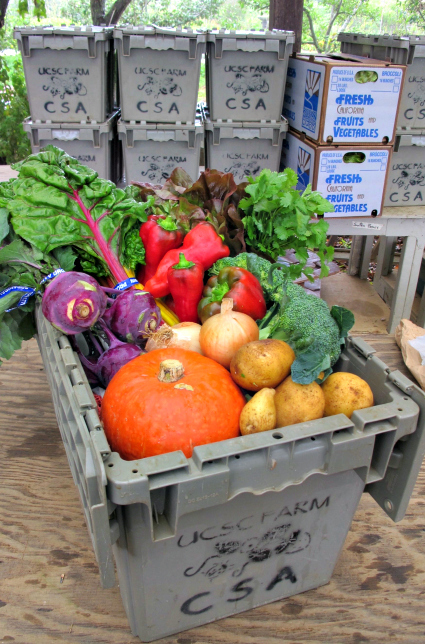 Community Supported Agriculture (CSA) members receive a box of freshly picked organic produce from the UCSC Farm each week while supporting one of the nation’s longest-running organic farming and gardening training programs. The UC Santa Cruz Farm’s Community Supported Agriculture (CSA) program is open for business and accepting new and renewing members. Members receive a box of freshly picked organic produce from the UCSC Farm each week while supporting one of the nation’s longest-running organic farming and gardening training programs. People who sign up by Friday, April 1, will receive a 5 percent discount on the share price. The 22-week CSA season runs from early June through early November; a “late season” plans begins in mid August. A share of produce contains a diverse supply of freshly harvested organic fruits and vegetables throughout the season (roughly 8–13 items per week) and is designed to feed a household of two or three for a week, or a larger family that perhaps doesn't cook every day but still wants to eat fresh, organic, and local. The CSA full-season rate will be $560 again this year, with optional payment plans. Sign-ups postmarked by April 1, 2016 will qualify for a 5 percent discount ($532 for a full share, $266 for a late-season share). Limited-income shares are available, and SNAP benefits are accepted for CSA payments. New this year will be an optional flower share to add to a CSA box from late June through late August. Flower share members will receive one large bouquet a week, featuring seasonal blooms from farm fields. Species and colors will change with the season, but members can expect annual and perennial blooms including snapdragons, dahlias, zinnias, strawflower, celosia, stock, lisianthus, and much more. Additional flowers can be purchased at the farm stand on Tuesdays and Fridays. The flower share will be an additional $10 per week for 10 weeks. For questions or more information about the Center for Agroecology and Sustainable Food System's Farm CSA project, call (831) 459-3240 or send email to casfs@ucsc.edu. To request that a form by mail, please contact Pam Dewey, casfs@ucsc.edu, or (831) 459-3240.